All right, it took some time to process what has happened, but I’m ready to say my piece. I’d like to preface this article by stating very clearly that I do not dislike “The King’s Speech.” I think that it is at least a solid film and a “good” film. The film at least deserved a few nominations, as even I gave it in the Edgy Awards last week. Try to keep that in mind, even if everything I am about to write flies in the face this statement. Furthermore, I’d like to state a disclaimer. It is my dream to do this for a living. I want to be a professional film critic and awards pundit and I would very much hope this blog to be a launching point for that goal. However, it is important for all of my readers to remember that this IS a blog. If I was to write for a syndicated newspaper or established professional website, I would do my best to keep my opinions dutifully in check and maintain an even-keeled view on the world of cinema. Yet, on this blog, I reserve the right to tell it like it is, as they say, and let slip my own dogs of war upon the current situation. I’ll just start things off by just coming out and stating it: “The King’s Speech” winning Best Motion Picture of the Year has got to be one of the worst decisions that the Academy of Motion Picture Arts and Sciences has ever made. I do not say this only because the film is grossly undeserving of such a distinction. I say it because of the audacity in picking what is obviously the safest route among a crop of much edgier and, ultimately, better films. I’ve said it once, and I’ll say it again, and I know you all never get tired of hearing it. “The Social Network” is the best film of the year. In my opinion, this statement is indisputable. It deserved the Oscar perhaps more than any other film in at least the last decade. Last night was a proverbial snub, one of the very worst kind. However, it’s much more than that. i don’t know about everyone else, but I think that it’s the goal of human civilization to move forward with the times. We should always be advancing as a people. The Academy it seems, does not see it that way. Filmmaking is always a changing medium, constantly progressing and reinventing itself. Many films this year, including “Black Swan,” “Inception,” “Toy Story 3,” “127 Hours,” and above all else, “The Social Network” are indicative of this notion. “The King’s Speech” represents a backwards-moving logic; filmmaking of the most basic, uninventive and insipid quality. Last night’s events were not only a disappointment for cinema and those who believe that the Oscars should reflect the best that the industry has to offer. They were not just a slap in the face of some of the finest filmmakers at the top of their game producing some of the greatest work of their careers. What it is, however, is the setting of a dangerous precedent. The Academy has made it very clear that the award for Best Picture does not have to be based on what’s the best film, but rather what is the best film for them, so to speak. 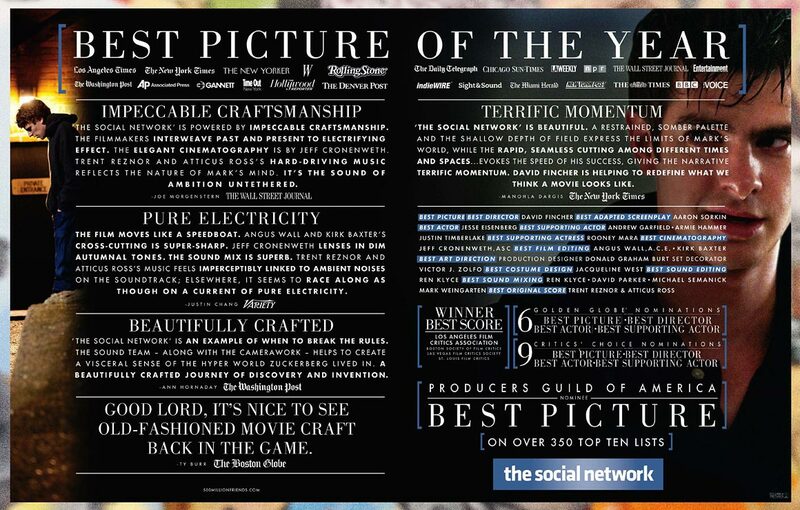 “The Social Network” had practically a monopoly on all critics’ awards for Best Picture. This was not a fluke. These are individuals who know about film. They are paid for their opinions because their opinions are intelligent, educated and respected. They are also people who take great pride in their work. They are not influenced by outside parties and they are not in cahoots with each other. With one voice, these critics from dozens of different outlets and cities almost universally declared “The Social Network” as the best film of the year. So what happened? David Fincher’s film was on a winning streak like has never been seen before up until the awards shifted from the critics to the industry itself. 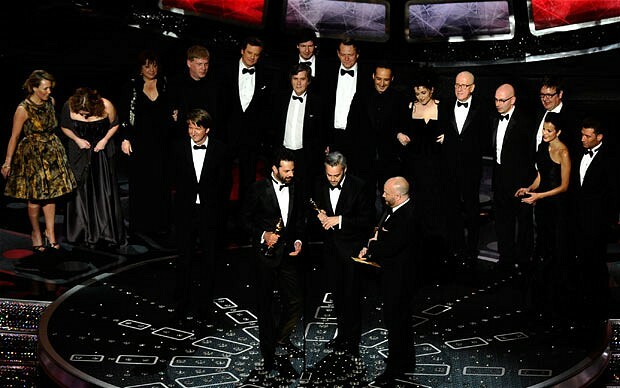 “The King’s Speech” captured awards from the Producers Guild, the Directors Guild and the Screen Actors Guild. So why is that the people who make movies have such a unified opinion against “The Social Network”? It’s because “The King’s Speech” is the epitome of Hollywood’s ideal movie. It’s low-budget. It was a huge box office success. It has an enchanting cast and a heartwarming story. It’s noncontroversial. It’s likeable. Bottom-line: it’s easy. This is the type of movie that Hollywood wants to make: ones that the audience will eat up hook, line and sinker. Not the best, just good enough. That’s the reality we live in. Well, speaking as one of the hundreds of critics in the country who were just informed that we were flat-out wrong, I consider this a disgrace. If that’s the present world, then I guess all that’s left is the future. And what will the future tell about the current situation? I personally can’t wait. I can’t wait for the day, maybe twenty years from now, when “The Social Network” is considered a classic; an artful and original masterpiece that is completely indicative of our time and culture. And what will “The King’s Speech” be? It will be forgotten. It will go down as a second-rate “Shakespeare in Love,” remembered only in passing simply as the film that, quite oddly, beat “The Social Network” for Best Picture. Like it or not, only one of these films will truly stand the test of time. In the meantime, we have to accept reality and just hope that next year will bring better results. Only twelve months to go, and you can bet I’ll still be here writing about it. Hope you all are, too. 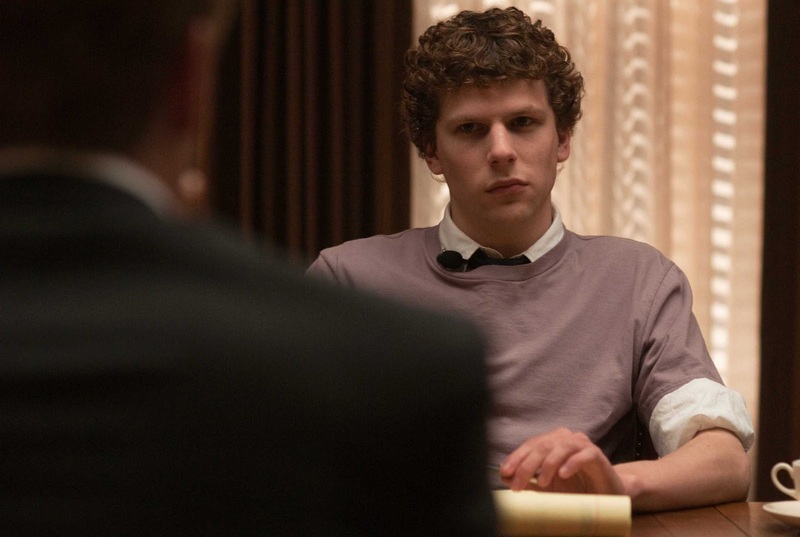 Do you think that part of the reason ‘The Social Network’ did not win was because it was shot digitally? The Academy seems to be pretty set in its ways and traditions. Do they still hold film to be inherently superior to digital? I really don’t believe it had much to do with what the film is printed on. Digital cinematography is still a relatively new concept in Hollywood, and yet it is still taking hold, stronger than ever. Two of the Best Picture nominees from this year were shot digitally (“127 Hours” and “TSN”), making that five in the last three years (added to “District 9,” “Avatar” and “The Curious Case of Benjamin Button). Three of all those films were even nominated for Best Cinematography, including a win in “Avatar”. Even Steven Spielberg, one of the strongest opponents of the technological shift, shot his next film, “The Adventures of Tin Tin,” onto digital media. I will admit that had the digital aspect of “The Social Network” bothered anyone on the awards circuit, it would be the Academy, for they would have the most “hands-on” right to object. However, any curmudgeons who would think to snub a film just for that, despite it being a thing of pure visual beauty, you could probably count a couple of hands. A minority may object to the shift in general, but not choose to take their issues out on one film. The majority probably just don’t care to notice. I foresee at least one digitally shot film winning Best Picture within the next five years. Kuddos for keeping your cool through this blog. The 83rd Academy Awards – Postgame Coverage And there that is….